There are four types of hypersensitivity reaction. These include type II hypersensitivity reaction, type II hypersensitivity reaction, type III hypersensitivity reaction and type IV hypersensitivity reaction. Type I hypersensitivity reaction may present as anaphylactic reaction, allergic rhinitis, asthma, atopy reaction or local wheal and flare. Type I hypersensitivity reaction is also known as IgE mediated hypersensitivity reaction. The antigen will crosslink with the cell bound IgE on the mast cells which are presensitized and the basophil. This will lead to the release of the vasoactive amine which further cause contraction of the visceral smooth muscle, vasodilation and inflammation of the tissue as well as increase in the permeability of the vessel. Type II hypersensitivity reaction is also known as antibody mediated cytotoxic hypersensitivity reaction. Type II hypersensitivity reaction may present with immune hemolytic anemia, acute renal failure, erythroblastosis fetalis and Goodpasture syndrome. Type II hypersensitivity reaction occur due to IgG and IgM antibody which react to the cell bound antigens . This will result in destruction of the antigen bound cell from the activation of the complement cascade reaction. Type III hypersensitivity reaction is also known as immune complex mediated hypersensitivity reaction. Type III hypersensitivity reaction is associated with serum sickness and arthus reaction as well as rheumatoid arthritis, SLE and polyarteritis nodosa. Serum sickness consists of arthralgia, fever, dermatitis, lymphadenopathy and proteinuria. 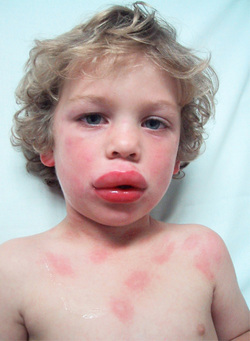 Arthus reaction is a localized cutaneous and subcutaneous inflammatory response to allergen which is injected. Type IV hypersensitivity reaction is also known as T -Cell mediated delayed hypersensitivity reaction. Type IV hypersensitivity reaction is associated with allergen which binds the endogenous protein. It is presented to T cells. Further exposure to allergen, inflammatory reaction may be erupted due to the present of memory T cells. Patient may present with hypersensitivity pneumonitis and allergic dermatitis. The main treatments of type I, type II, type III and type IV hypersensitivity reaction are corticosteroids and antihistamine. Treatment of the underlying condition should also be focused.